Despite the government’s recent measures to contain the rupee’s fall, the Indian currency remains on a weak footing. In the last one month, the rupee has depreciated by around 14% against the dollar and is among Asia’s worst-performing currencies. At the same time, global crude oil prices remain elevated (see chart). Both these factors playing out concurrently mean that India’s current account deficit would be uglier than anticipated. As for corporates, it would impact the financial performance of companies significantly exposed to crude oil prices and currency fluctuation. Listed below are some of them. Manufacturers of tiles, plywood, paints and adhesives, and oil marketing companies would feel the heat. Power and fuel (largely gas) costs account for around 20-22% of revenues for tile companies, as per analysts’ estimates. Tile makers based in the Morbi district of Gujarat usually procure gas locally from Gujarat Gas Ltd. Those situated outside the state import it from the Middle East. “A 10% jump in Brent crude and the USD/INR rate each (year-on-year) has almost a 29% and 61% impact on profit before tax (PBT) for Kajaria Ceramic and Somany Ceramics, respectively," said a JM Financial Institutional Securities Ltd report dated 11 September. On the other hand, the brokerage house sees minimal impact on Cera Sanitaryware Ltd given its product mix. Historically, tile makers have been able to pass on such cost increases; however, in the current scenario of intense competition and sluggish demand, taking price hikes would be extremely challenging. Operating cost of companies in the plywood industry would also spike. Most chemicals used by ply and laminate companies such as phenol and methanol are derivatives of crude oil. Some analysts pointed out that even though some of these chemicals are sourced locally, they tend to be priced at import parity, making companies sensitive to exchange rate fluctuations. JM Financial estimates around 37%, 40% and 20% impact on PBT for Greenply Industries Ltd, Century Ply Ltd and Greenlam Industries Ltd, respectively. Foreign brokerage house CLSA Ltd concurs. It finds Century Ply as the most vulnerable stock among its coverage with around 50% of raw materials imported, inability to immediately pass on cost increases and sizeable forex borrowings. “Our calculations suggest a ~2.5% margin impact, assuming a currency mark to market (MTM). We cut FY19/20 earnings per share estimates for Century Ply by ~8%," CLSA said in a note dated 11 September. Similarly, monomers and titanium dioxide used in paints is derived from crude oil. Since Indian paint companies import these raw materials, it puts their operating and gross margins growth at risk. Also, vinyl acetate monomer—a key raw material for making adhesives—accounts for 60% of Pidilite Industries Ltd’s total raw material cost, and is imported. Analysts are pencilling in around 350-400 basis point gross margin hit for paint companies. A basis point is one-hundredth of a percentage point. It should be noted that in the recent past, paint and adhesive makers have been consistently raising prices to protect margin erosion. So, the adverse impact of a weak rupee and high input cost could come with a lag. 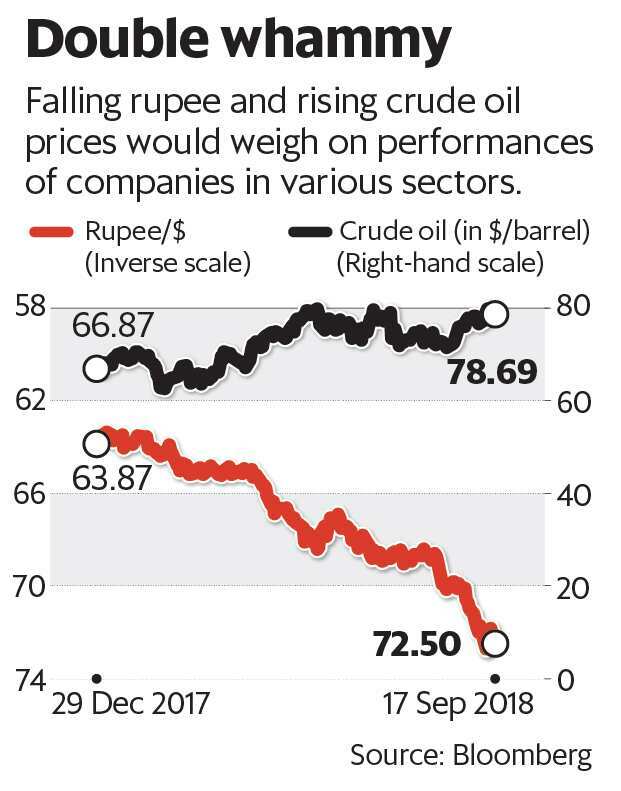 Lastly, volatility in international crude oil prices and the weakening rupee poses a threat to financial performance of state-run oil marketing companies. Meanwhile, it is difficult to gauge the impact of the rupee’s depreciation and surging oil prices on Nifty’s earnings per share, but both factors playing out together is a sentiment-negative and will weigh on the Indian stock market.